NEW YORK—It’s no surprise that at the turn of the 20th century, imagery of cowboys and Indians were loved among the art-consuming public for the nostalgia they evoked. The surprise is that many bronze artworks depicting the Wild West were made in Brooklyn. The Metropolitan Museum’s new exhibit, The American West in Bronze, 1850–1925, explores the ways life on America’s western frontier was depicted in bronze, a medium that American artists favored over expensive European-quarried marble for its relative availability. The popularity of these bronzes, along with the fact that they were primarily consumed by an East-Coast public detached from the realities on the western frontier, reduce these technically superb works to the level of curiosities. The exhibit, consisting of 65 bronze sculptures by 28 artists, is organized into four themes. The first two themes center on the land and its people as it was before settlers arrived in droves. Depictions of American Indians hunting or praying make up the majority of the first section. Bronzes of wildlife—prowling mountain lions, wooly bison, wild horses, and others—whose numbers dwindled in the rapidly developing American West form the second section. The last two sections focus chiefly on white settlers who eked out livings as cowhands, fur trappers, and gold prospectors. The Indian Removal Act was signed into law by President Andrew Jackson in 1830. By the mid-1890s, most Native Americans had been forcibly moved from native lands and onto reservations hundreds of miles from where tribes traditionally hunted or practiced subsistence farming. The bronzes depicting people, whether they were white or red, both ostensibly celebrate ruggedness and self-sufficiency. But the way of living off the land represented by the first two sections had been, for the most part, blotted out by the market economy-based one represented by the last two. The cause and effect relationship represented by the two halves of the exhibit is not highlighted in its structure, but it is hard for us to ignore, though it might have been for the original consumers of these sculptures. Several of the artists whose works are in the exhibit were based on the East Coast and produced their art for an East Coast market. Life in the West was deeply personal for others. These artists, whether they created portraits of Indian chiefs, a bronco buster struggling to tame a wild horse, or Native American hunting scenes, may have been inspired by real people using their ingenuity to survive in unforgiving or unfamiliar terrain. They probably struggled with complex feelings when Native American friends were sent away. For example, James Earle Fraser’s 1918 sculpture “End of the Trail” depicts a tired horse and rider who presumably made the long and dispiriting journey onto a reservation, an event he witnessed growing up in Dakota Territory in the 1880s. 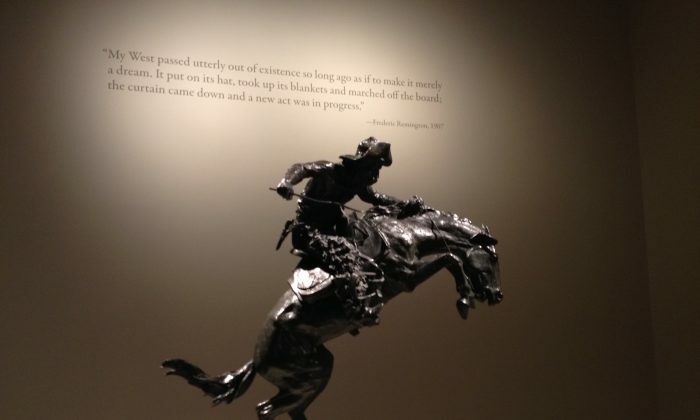 What East Coast audiences wanted, however, was often escapism and something to feed a masculine mythos, particularly when it came to bronzes depicting cowboys, according to Tolles. “Most of the people they were making their work for, who never traveled west of the Mississippi, wanted a sugarcoated version of what it was really like out there,” she said. By the 1840s, American sculptor Henry Kirke Brown had established a foundry in Brooklyn with the help of a couple Frenchmen, eventually partnering up with Ames Manufacturing Company in Chicopee, Mass. Sculptures from both foundries are represented in this show. Casting facilities were established in the Northeast and spread further west. This technology allowed artworks to be easily and cheaply reproduced, making sculpture a popular art. After the exhibit closes in New York in April, it will travel to Denver, Colo., and then Nanjing, China.